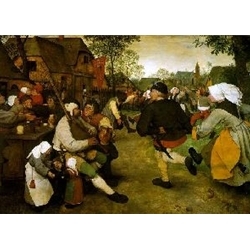 Pieter Bruegel the Elder (byname Peasant Bruegel, also spelled Brueghel or Breughel), the greatest Flemish painter of the 16th century, whose landscapes and vigorous, often witty scenes of peasant life are particularly renowned. He spelled his name Brueghel until 1559, and his sons retained the "h" in the spelling of their names. Since Bruegel signed and dated many of his works, his artistic evolution can be traced from the early landscapes, in which he shows affinity with the Flemish 16th-century landscape tradition, to his last works, which are Italianate. He exerted a strong influence on painting in the Low Countries, and through his sons Jan and Pieter he became the ancestor of a dynasty of painters that survived into the 18th century.